The Total War series of PC strategy games does not dream small. Players choose a nation – a sweeping empire, ambitious upstart republic, barbarian horde, or anything in between – and set out to conquer all before them. On the games’ strategic map, players move around armies, spies, and generals; form new alliances and break outdated ones; and sink their money into economic development or raising fresh troops. When those armies clash, the game swoops down to put the players in control of a 3D battlefield showing hundreds or thousands of men at a time, charging, fighting, dying, fleeing. Set in periods such as the late classical world (Rome: Total War), Sengoku Japan (Shogun: Total War), and the Middle Ages (Medieval: Total War), the games wear a veneer of history, but ultimately they are not about accurately representing the past. They are about bringing toy-soldier childhood play to thrilling life. The series’ ambition reached its zenith in Empire: Total War (my writeup here). Set in the 1700s – a century which started with a war over who should become king of Spain, and culminated with the American and French revolutions – Empire propelled the series into the age of gunpowder. And instead of tasking the player with the conquest of Europe or Japan, Empire broadened its scope to the whole world. In Empire, players can fight in three main theatres (Europe, North America, and the Indian subcontinent) and send ships to four lesser ones (the coasts of Brazil, West Africa, and the East Indies, and the straits of Madagascar). British redcoats can square off not just against French regulars in the fields of Flanders, but Iroquois warriors in the Thirteen Colonies, Maratha cavalry in India, or those same French in Quebec. Empire also plunges into naval warfare, allowing players to command their ships in battle and using overseas trade as a carrot to reward players for achieving command of the seas. Unfortunately, Empire has a particularly noticeable Achilles’ heel. 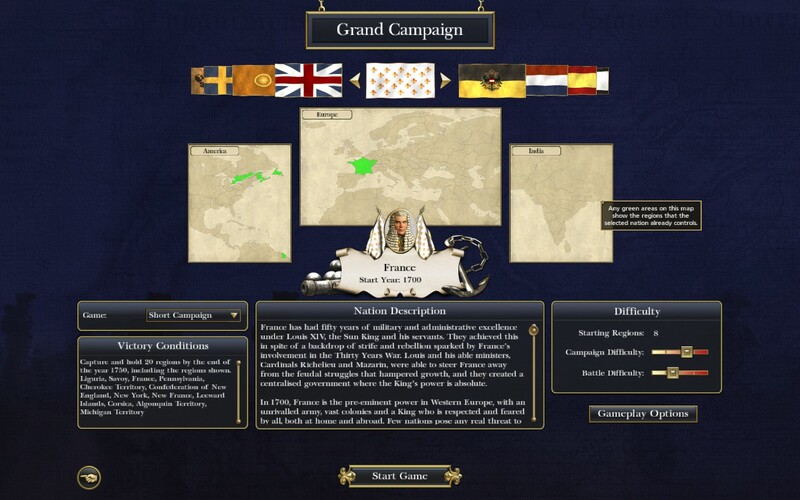 As with many other strategy games, the computer player cannot keep up with a human over the course of the campaign*. The option to play the campaign in multiplayer alleviates this problem. And this is what Peter Davies, aka beefeater1980 (edit: later replaced by Shane Murphy, aka Talorc), and I are doing. Each of us manages his respective kingdom and commands his troops and ships on the battlefield. And the way the Empire multiplayer campaign works, each time one human player fights a battle against a computer player, the other player is given the chance to take over for the computer. The result should be a game that’s exciting and epic in equal measure, and so far, it has lived up to our hopes. The game: Empire: Total War. The rules: The winner of the game will be determined by Prestige, which as far as we can tell is awarded for researching certain technologies, and building fancy public buildings ranging from infrastructure to palaces. We have set the campaign difficulty to Hard (which gives a boost to the computer players) and the battle difficulty to Normal. The two sides: Peter Sahui (PS) as Britain (that’s me!). Peter Davies (PD) and later Shane Murphy as France. Our game begins in 1700; historically, this was the eve of the War of the Spanish Succession. Great Britain** is allied to Portugal, the Netherlands, Austria and Hannover. France is allied to Spain. Britain controls the British Isles, Jamaica, the Bahamas and Prince Rupert’s Land; France controls metropolitan France, the Windward Isles and what, today, is eastern Canada. Each of us also has certain American possessions represented by a computer-controlled ally: the Thirteen Colonies for me, Louisiana for the French. Geography presents several obvious potential flashpoints for the two powers. But while conflict is inevitable, when it will break out, and the form it will take, are not set in stone. * Based on my personal experience playing as the British in single-player. 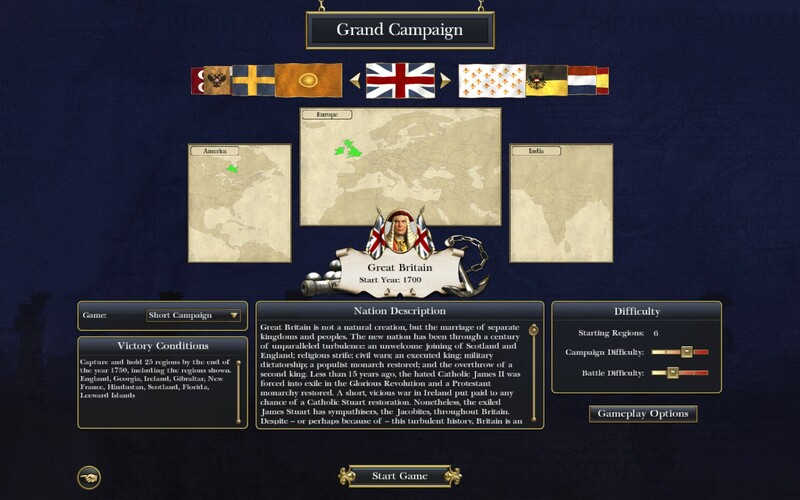 ** In real life, England and Scotland did not come together to form Great Britain until the Act of Union in 1707; however, the game represents them under the British banner from the start.